Thank you all very much for participating in the fastest writing contest in the Midwest! We appreciate your writing courage & quick imagination, and we look forward to seeing all of your terrific submissions. Submissions must be received by Saturday, March 2 at 5:00 p.m. CST (tomorrow!). Submissions must be emailed to midwestwritingcenter@gmail.com (preferred)—you can just send them as a reply to this email, if you like—or delivered to the MWC office (please note our offices and the library close at 5pm on Saturdays). Please do not mail your submissions. If you have not yet indicated which category you will be competing in, or if you would like to change categories, that’s fine—please indicate which category you are submitting for when you email/return your submission. If you decide you want to compete in more than one category, that is fine, but you will need to pay $10 per category you will be competing in (this can be done through the Iron Pen page on our website). We strongly encourage you to submit via email. Email submissions should be sent as MS Word attachments (.doc, .docx, .rtf—no .pdf please), or pasted into the body of the email (attachments are strongly preferred, in order to preserve the formatting of your work). Please include “IRON PEN SUBMISSION” in the subject line of your email (or, again, just send as a reply to this email to keep it simple J). Limit of one poem, one story, or one nonfiction piece per entry (but you are welcome to submit multiple times in a single category with a paid registration for each entry, and, of course you are welcome write as many as you can/want/need—just submit your best one!). Fiction and nonfiction pieces must be 2,000 words or less; there is no word limit for poems. Submissions will be read anonymously by the judges. Winners will be announced the evening of Wednesday, March 6 via email, on the MWC home page, and on Facebook. The awards ceremony is Saturday, March 9 at 2:00 p.m. here at the MWC. The winners in each category receive medals, 2nd and 3rd place in each category receive certificates. Winners will be featured readers at the awards ceremony, but anyone who participated in this year’s contest is welcome to come and read their submission so we can all enjoy your efforts! Please remember that everyone that participates in this year’s Iron Pen Contest will have a chance at winning a full registration with value of approx. $265 for the David R. Collins Writers’ Conference, June 27-29, 2019. There will be a drawing at the awards ceremony next Saturday to determine the winner. You do not have to present to win, but it would terrific if you are! A Note on the Prompt: The Iron Pen prompt, or part of the prompt, can be used as the title of your piece, as an epigraph, as the first line, somewhere in the text of the piece, as a premise for your piece, an inspiration, etc. The prompt does not have to appear explicitly in the text of your submission, but its influence/inspiration/other use or reference must be clear in your submission. Your submission will be judged on artistic merit (60%), the adherence to/use of the prompt (30%), and technical execution, such as grammar, syntax, clarity (10%). Please let me know if you have any questions—I’ll be in the office today until 5pm, and tomorrow from 11am until 5pm. Please call or message me with any questions at 309-269-6569. Thanks again for being a part of Iron Pen 2019. Have fun & best of luck! The fastest writing contest in the Quad Cities is back and taking registrations now! 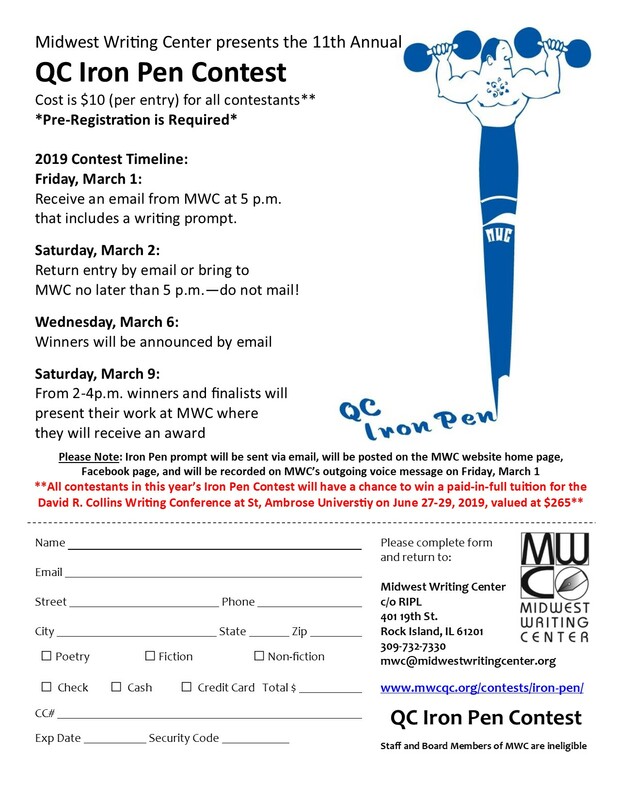 The Midwest Writing Center is taking registrations for its 11th annual Iron Pen Contest. MWC will supply a prompt to all contestants at 5 p.m. on Friday, March 1st and contestants have 24 hours (entries are due Saturday, March 2nd by 5 p.m.) to write and submit their best fiction, non-fiction, and/or poetry pieces. Writers are welcome to enter into as many categories as they like with a paid registration for each entry. The cost to enter the Iron Pen contest is $10 per entry, per category. Contestant entries will be judged blind in genre categories—Poetry, Fiction and Non-Fiction (please note there is a 2,000 word limit for fiction and nonfiction entries). The Iron Pen contest is open to all ages. Registration forms can be found via the link below or at the Midwest Writing Center, c/o RIPL, 401 19th St., Rock Island, IL 61201. This year all winners and finalists will have the opportunity to publish their work in the MWC’s annual Writers Block e-magazine, which will be released at MWC’s annual meeting in May 2019. Winners and finalists will also have the opportunity to publisher their work on the MWC website. On Friday, March 1 at 5 p.m. contestants will receive an email from the MWC that includes: a topic, an opening line, or a specific character. The prompt will also be announced on our website www.mwcqc.org and on the MWC voicemail message. On Saturday, March 2, contestants must email or bring their work to the Midwest Writing Center no later than 5 p.m. – please do not mail them. The winners of this 24-hours contest will be announced by email on Wednesday, March 6. Awards will be given out on Saturday, March 9 at 2 p.m. at the Midwest Writing Center, where the winners in each category will receive medals, and the winners and finalists will be invited to read their work.